Aporocotylids (fish blood flukes) are emerging as pathogens of fishes in both marine and freshwater aquaculture. Efforts to control these parasites are hampered by a lack of life cycle information. Here we report on the life cycle of Cardicola forsteri, which is considered a significant pathogen in southern bluefin tuna, Thunnus maccoyi, ranched in South Australia. We surveyed polychaetes, bivalves and gastropods from sites close to tuna pontoons. Infections consistent with the Aporocotylidae were found in terebellid polychaetes, a single Longicarpus modestus and five individuals of Reterebella aloba. All infections were comprised of hundreds of sporocysts in the body cavity of the host, each filled with developing and mature cercariae. Sequences of ITS-2 and lsrDNA from the infection from L. modestus were a perfect match with those of adult C. forsteri from T. maccoyi. This life cycle link is considered confirmed but it is possible that additional terebellid species are infected in South Australia; equally, other species of intermediate host are likely to be involved in other parts of the range of this cosmopolitan trematode. Sequences of the species from R. aloba did not match a known adult but phylogenetic analysis of lsrDNA suggests that it is also a species of Cardicola Short, 1953. 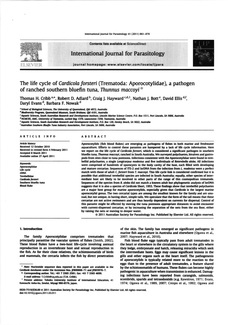 These findings show that terebellid polychaetes are a major host group for marine aporocotylids, especially given that Cardicola is the largest marine aporocotylid genus. The two cercarial types are among the smallest known for the family and are unusual, but not unique, in having short, simple tails. We speculate that the form of the tail means that these cercariae are not active swimmers and are thus heavily dependent on currents for dispersal. Control of this parasite might be effected by moving the tuna pontoons appropriate distances to avoid encounter with current-dispersed cercariae, or by increasing the separation of the nets from the sea floor, either by raising the nets or moving to deeper water.